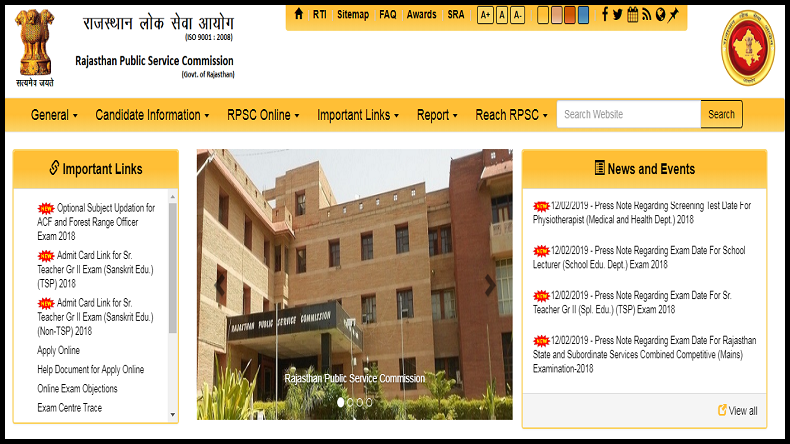 RPSC Exam Dates, Admit Card 2019: The dates of the upcoming competitive examination have been released on the official website of the Rajasthan Public Service Commission (RPSC). Candidates can now check the the same on the official website by following the steps given below. RPSC Exam Dates, Admit Card 2019: The Rajasthan Public Service Commission or RPSC has released a notification announcing the examination dates all the competitive exam scheduled to be conducted by the Commission through its official website. According to the latest updates in a leading daily, the dates are now available on the website rpsc.rajasthan.gov.in. All those who are interested to appear or are preparing for the RPSC competitive examinations for this year can check the dates and start applying for the same. The Commission has released the RAS and RTS Mains Exam, Senior Teacher (Special Education Exam) 2018 by Secondary Education Department, Senior Teacher- special education exam-Lecturer – School – exam 2018 by Secondary Education Department, Physiotherapist Screening Test 2018 by Medical and Health Department, Lecturer-School- exam-2018 by Sanskrit Education Department, State Engineering Services Competitive (Mains) exam, 2018, and ACF and Range Officer Grade- I exam, 2018 (Forest Department), as per reports in TOI. Meanwhile, the admit cards release date has also been announced on the official website. Candidates must note that they should start downloading the admit cards as soon as it is published on the website. How to check the dates of the RPSC Exam 2019? For more details regarding the examinations such as eligibility criteria, qualification, age relaxation and other necessary details, click on this link: rpsc.rajasthan.gov.in.